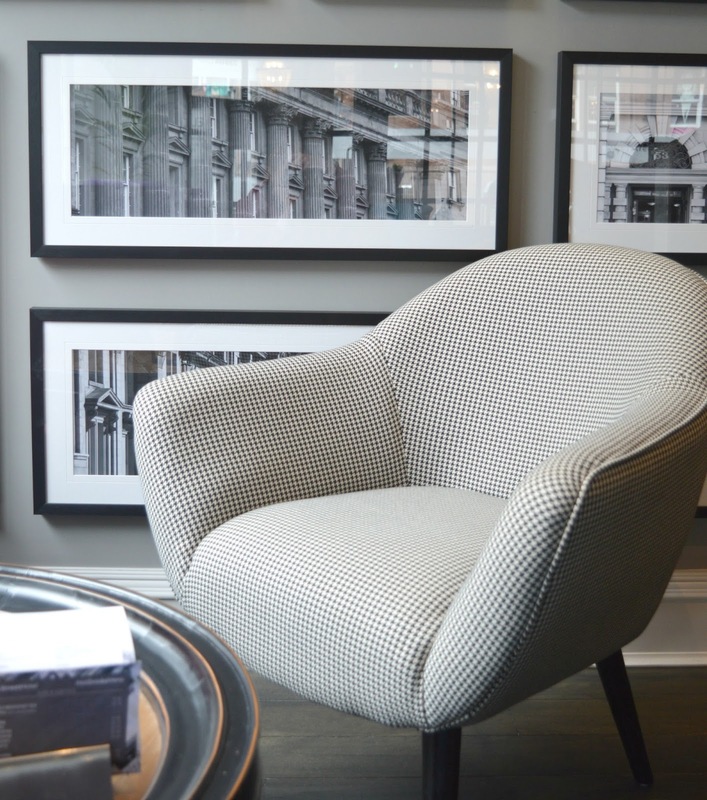 Whenever I'm planning a city break I always try and hunt out the most beautiful boutique hotel right in the centre of town so today I thought I'd share my favourite boutique hotel in the centre of Newcastle, welcome to the Grey Street Hotel. Housed in a stunning Grade II listed Georgian building on Newcastle's Grey Street, often described as the most beautiful street in England, the Grey Street Hotel is perfect for your city break in Newcastle. Recently refurbished, the hotel boasts 49 ensuite Georgian bedrooms and beautiful spa All About You (that has fast become my favourite place for treatments in Newcastle). I decided to book into the Grey Street Hotel for a mid-week overnight stay. I love the indulgence of booking a hotel in my own city - it can be such a welcome treat when you can't be bothered to make the bus journey home after an evening out. Check in was at 2:00 pm and, being one of those slightly annoying guests, I turned up 45 minutes early to try my luck. I was greeted by the lovely friendly staff who told me my room was ready and I was welcome to go straight up. It's good to know that if your room isn't ready the hotel will happily take your bags while you head out for an explore. 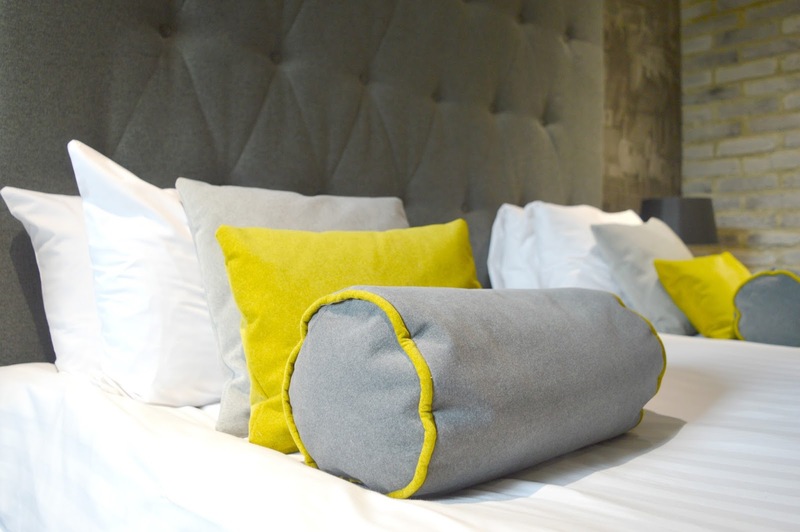 There are several types of room to choose from at the Grey Street Hotel; the Standard Rooms, slightly larger Deluxe Rooms or, if you're feeling extra fancy, a choice of five Unique Suites with additional luxury and comfort. All rooms come with the all important flat screen TVs, free wifi, air conditioning, tea and coffee making facilities, hairdryer, iron, safe, bottled water and organic toiletries - everything you need for a comfortable stay. My home for the night was the Lord Armstrong Suite, named after the famous inventor who built Newcastle's Swing Bridge. 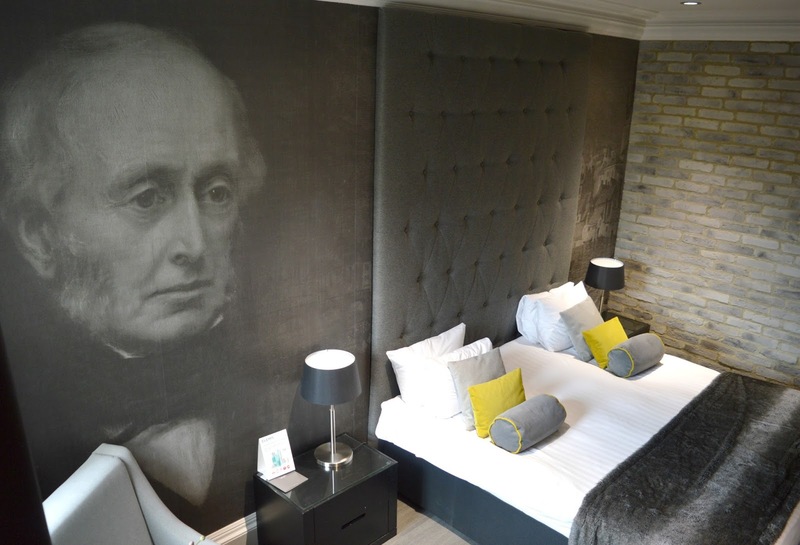 All of the suites at the Grey Street Hotel are named after influential people from the city and, if you're a bit of a history buff, there are some great little facts about them in the information book left in each bedroom. I loved the design of the Lord Armstrong Suite, it had a really cool and modern vibe to it yet the colourful cushions and faux fur throw made it feel super cosy. The bed was so huge I got completely lost in it and I had the most comfortable night's sleep. The room was split across two levels with the bathroom up a flight of stairs. I had plenty of fresh fluffy towels and toiletries to use and I was very happy in the morning to find that the shower was hot and powerful. Being someone who is shamefully addicted to social media I was so impressed with the speed of the free wifi at the Grey Street Hotel, it was far superior to our internet at home and I spent quite a lot of my evening snuggled up in the cosy bed watching YouTube. Sometimes when I'm staying in a hotel I love to have a cosy night in my hotel room and the extensive Room Service menu at the Grey Street Hotel makes it easy to plan your night in. Room Service is available from the Living Room Bar and Restaurant next door to the hotel and you can place an order via the hotel reception between 12:00 pm and 10:30 pm. The Room Service Menu includes Sharing Plates, Deli Sandwiches, Burgers and classic favourites. 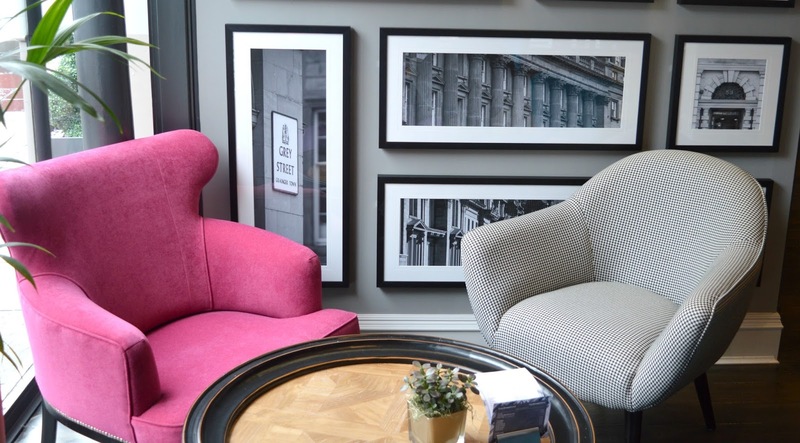 If you fancy a change of scenery from your hotel room then the reception area at the Grey Street Hotel is a lovely little spot to relax with a cuppa. With colourful comfy sofas and chairs it's a peaceful place to spend an afternoon and come evening if you can't be bothered to venture out you can order yourself a beverage to enjoy. 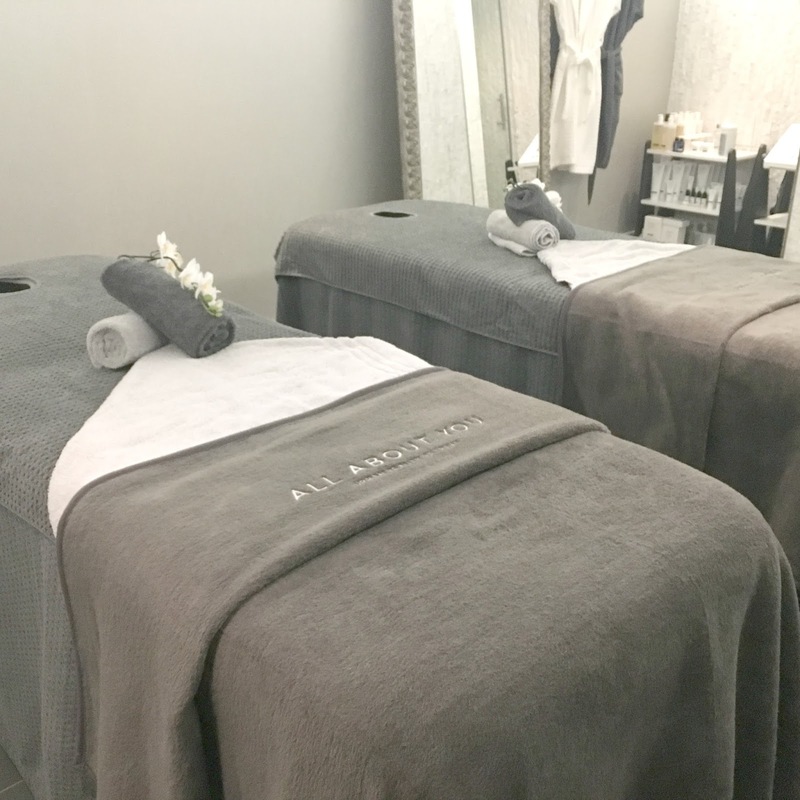 The All About You Spa is a recent addition to the Grey Street Hotel and I'm a huge fan! I've already been for a pedicure and a wax and I love it! Hidden in the basement of the hotel it's a beautiful space, luxuriously furnished in white and grey with pops of mustard yellow. Each time I've visited I've found it hard to leave! Each bedroom has a treatment menu for you to look through and guests of the hotel get a discount card to use in the spa. With a full range of treatments available including manicures, facials, massages and makeup counter, you can read all about my experience here. The Grey Street Hotel is ideally joined to the Living Room Bar and Restaurant where Reception will be happy to book you a table for dinner. 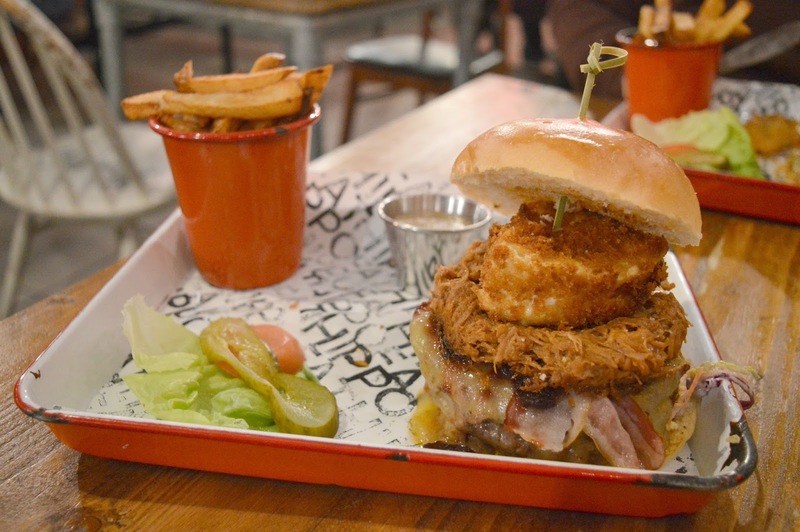 If you fancy adventuring out then some of our favourite places to eat in Newcastle are a short stroll from the Grey Street Hotel including Las Iguanas, Fat Hippo Underground (who serve the best burgers in Newcastle!) 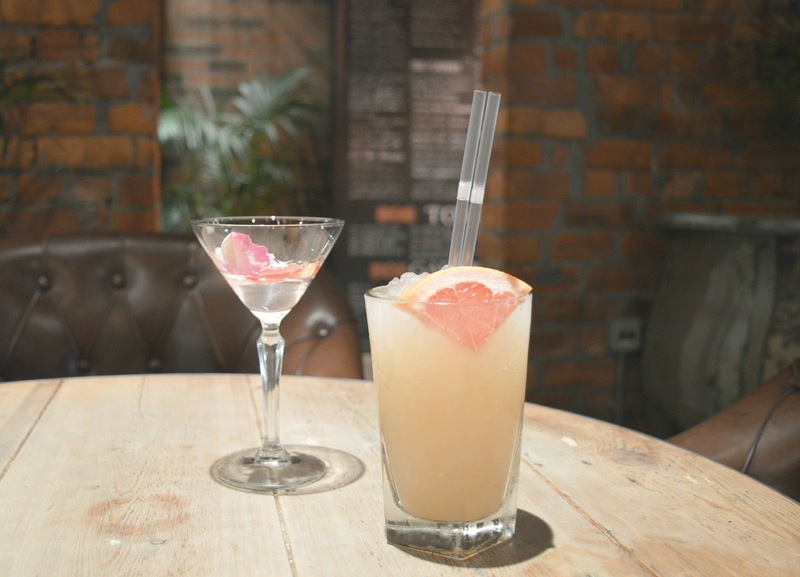 and The Botanist. Of course, every hotel stay ends with a perfectly prepared breakfast. The Grey Street Hotel offer an in-room breakfast service where you can order from the room service card which you hang outside your door. An express breakfast for those in a rush costs £5.95 per person or, if you prefer to be a little more indulgent a cooked breakfast is £10.00 per person. The Living Room Bar and Restaurant next door also offer hotel guests cooked and continental breakfasts served betweeen 7:00 am and 10:00 am on week days and 7:30 am and 10:30 am on weekends. If you'd prefer a bit of a leg stretch then there are plenty of great breakfast spots on the doorstep of the hotel including Tyneside Bar Cafe round the corner and Cafe Royal a short stroll away. 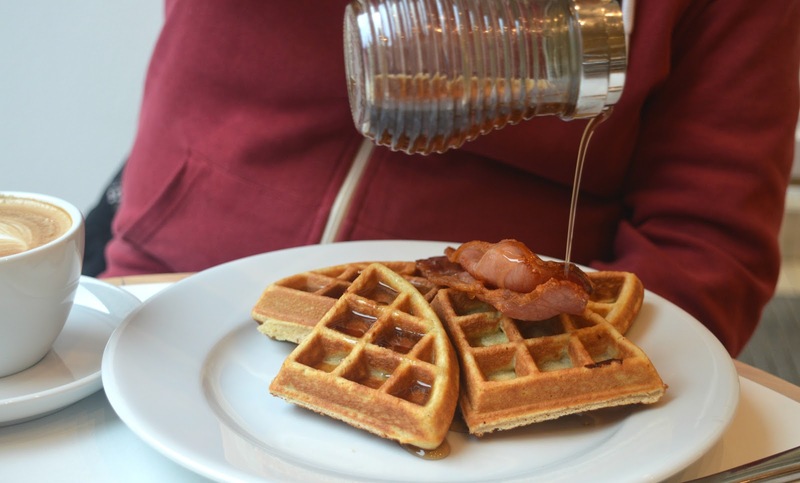 For even more breakfast inspiration check out my Guide to the Best Breakfasts in Newcastle. Of course, if you're staying in Newcastle you'll be wanting to make the most of your stay and the Grey Street hotel is a very handy spot. A short stroll down the hill you'll find the picturesque Quayside with the world famous Tyne Bridge and an ever increasing collection of restaurants and bars. The city centre shops are a short stroll up the hill and must visits are Eldon Square shopping mall, Fenwick's flagship store on Northumberland Street and Grainger Market where you'll find loads of local traders selling the most delicious local produce. Theatre fans will find Newcastle's Theatre Royal less than a 5 minute walk from the hotel with the largest touring productions put on shows. If you fancy an adventure a little further afield then Monument Metro Station is a stones throw away from the Grey Street Hotel and is a gateway to adventure! If you have extra time to explore I highly recommend paying a visit to the suburb of Jesmond or the coastal towns of South Shields or Tynemouth. 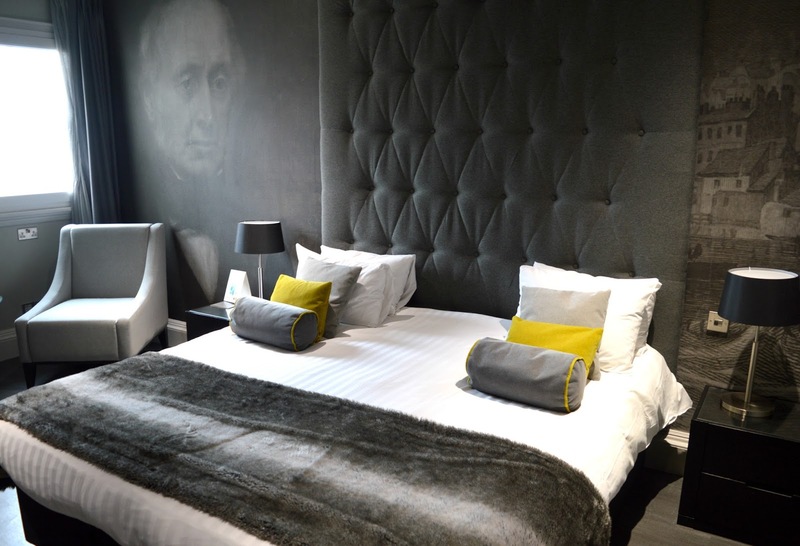 The Grey Street Hotel is the perfect city centre hotel, ideally located to enjoy a weekend break in Newcastle and I can't wait to enjoy another stay! For more inspiration on what to see and do in Newcastle check out New Girl in Toon on Facebook and Instagram. 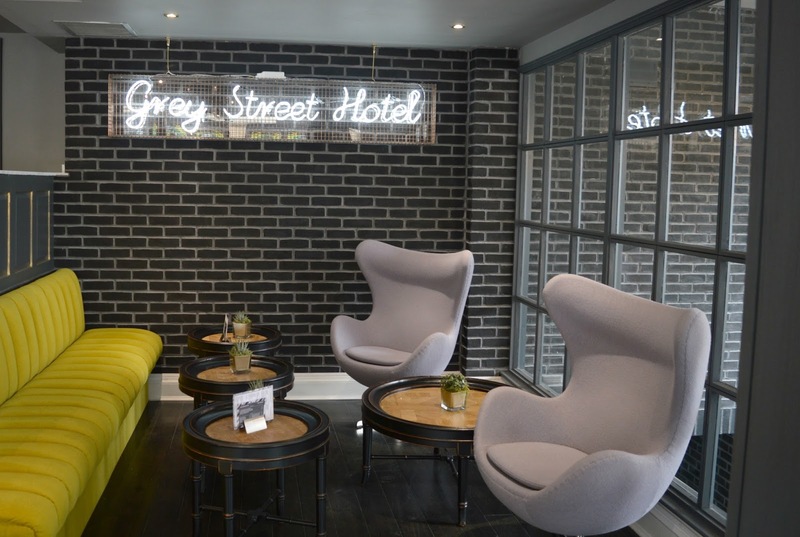 We enjoyed a complimentary stay at the Grey Street Hotel for review purposes. All opinions are our own. It looks gorgeous - I really do like the decor here and I don't think there's a better located hotel in Newcastle!